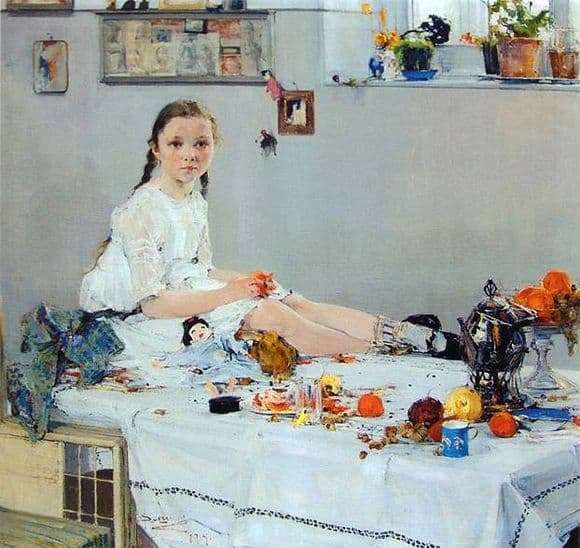 On the canvas depicts a girl who sits on the table. The decor in the room is modest, but many details are scattered, which forms a mess. This situation is typical of children of this age. A girl can be given about ten years, but her look is absolutely adult. Her eyes convey the depth of thoughts of a person who has known the world. It would seem that the child still does not worry about anything, but the depth of the eyes is simply amazing. They express caution and restraint. The artist very accurately traced the details and the background. Many items are depicted clearly and clearly. In the scattered toys, you can even distinguish the details. It is fleetingly possible to take the heroine for a big doll. She seemed frozen in bewilderment among children’s things. The painter depicted childhood as such. Game and pranks, carelessness and naivety. The white dress of the girl emphasizes cleanliness, two pigtails complement the image of the schoolgirl. An ordinary no-frills bright room is painted with bright details that are randomly scattered. This is childhood. Children bring brightness, chaos, and this is their charm of presence. The place was not chosen by chance, it serves as an ideal background for the girl. The painter is very attentive to the details, in his works there are no coincidences and coincidences. Forty years after writing the work, a woman appeared who posed for this picture as a child. She told in detail how the process itself went through, opened the veil of all models of models. She was terribly uncomfortable to sit, and long work did not bring pleasure. The image of the girl and accumulates in itself the infinity of thoughts expressed in one look of the child.